To her shame, Emma Burnell didn’t know very much about the events of the Maidan revolution in 2014.That changed this week as she took part in an immersive theatre experience that had her waking several times in the night thinking of the lessons we should have learned and didn’t. Set in the days around the uprising in Ukraine, Counting Sheep tells the true story of Mark and Marichka – musicians who meet in the tumult of events and simultaneously fall in love and into revolution. 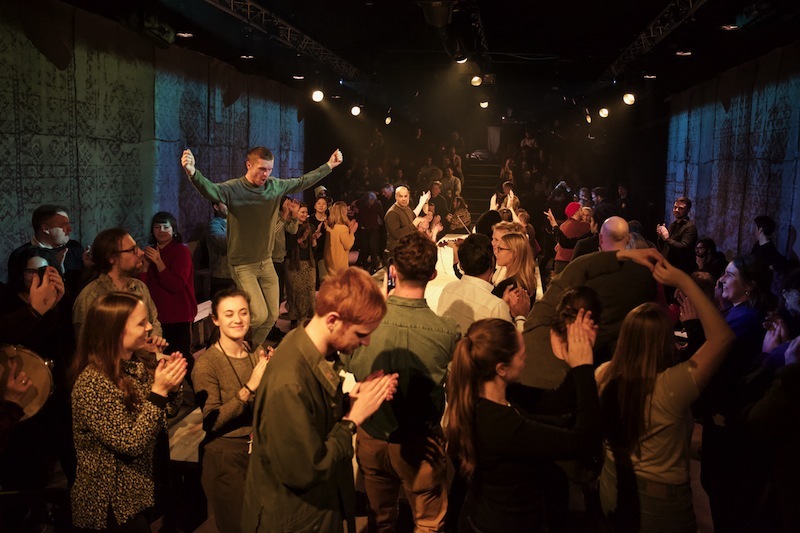 I have reviewed the play’s brilliant theatricality elsewhere. But it is the political message of the play to a country going in the opposite direction that are breathtakingly vital. The conflict came with the suppression of hopeful young people waving the blue and yellow flag of the EU. They saw in that symbol a sign of hope that we have all but lost sight of in the UK. Revolutions don’t have just one cause. And neither the play nor I want to oversimplify the complex set of reasons for the uprising. But it is fair to say that this was in good part an East/West split between those who wanted to stay close to the orbit of Putin’s Russia and those seeking greater protection against Russian expansionism from the EU. Tensions boiled up over corruption, inertia and many other things, but the conflict came with the suppression of hopeful young people waving the blue and yellow flag of the EU. They saw in that symbol a sign of hope that we have all but lost sight of in the UK. The UK are choosing to deliberately stand vulnerable and alone at a time when the world is in chaos and turmoil. In the five years since the Ukrainian uprising and subsequent Russian annexing of Crimea. the extent of the Putin government’s attempts to interfere in Western democracies has become much clearer. We know they intervened in the 2016 US elections (and strongly suspect they had help on the inside). We have also been presented with a slew of information from fearless journalists like Carole Cadwaladr and Byline’s own Peter Jukes that they played a significant role in Brexit. The UK are choosing to deliberately stand vulnerable and alone at a time when the world is in chaos and turmoil. The protections offered by being a part of the EU are an argument I never heard properly made by the bloodless men in grey suits who ran the Remain campaign on the letters page of the FT. The EU stops wars and saves lives. In the big system fight over leaving the EU, what has been missing from the dialogue about Brexit even now is the impact on individuals. Their lives and their futures. We talk of markets, economies, backstops. Not of the jobs lost and families torn apart. We talk of food and medicine crisis – but in the abstract, not the reality of the people we will lose. We need to lift up the voices of individuals whose lives will be wrecked by this recklessness. But as well as individuals, we need to stop focusing on the elements of the EU that bring us prosperity and remember that it also brings us peace. The EU stops wars and saves lives. Seeing this play – and meeting the real Mark and Marichka –made me realise that wanting to be part of the EU doesn’t just entail wanting its benefits for myself and my family. It doesn’t even mean wanting its benefits for all EU citizens entitled to free movement. It means that as part of that block of nations protecting each other and pursuing peace – as we have done for 60 years – we are the hope that the optimists of Maidan sought out. We owe it to them to live up to that. As the embers cool in the devastated sections of Notre Dame de Paris and the world comes together to restore it, it seems a good time to reflect on the effect that historic churches and cathedrals have had on my own life.